Using a double boiler, fill the lower pan 1/3 full of water and bring to a simmer. Pour milk into upper pot, and place over boiling water. Heat until small bubbles form around the edges of the milk. Stir in sugar, and continue to stir until sugar is completely dissolved. Beat the eggs in a bowl until light yellow but not frothy. Slowly dribble in about 1/2 cup of the hot milk into the eggs, stirring with a whisk constantly. Once the eggs have been tempered, pass through a sieve to remove any coagulated egg particles, and then slowly mix the strained egg mixture into the remaining milk in the pan. Mix together cornstarch and water; slowly stir into custard. Bring custard to a boil, and remove from heat. Stir in vanilla. 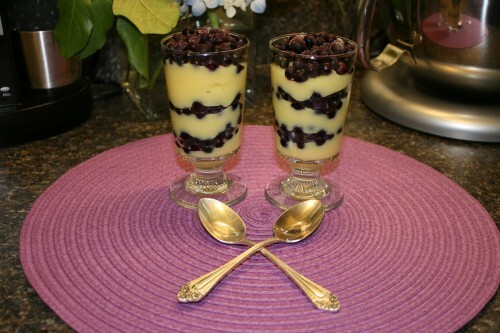 Layer in glasses with blueberries.